Hidden Treasure – Hello Korea ! Yesterday I went to the Jongno district to visit the Hanbok museum and the National Folk Museum of Korea. I wanted to go to the Hanbok (traditional folk costumes) museum to learn which kind of Hanbok is worn for which event. But I couldn’t find the damned place. I asked a policeman and learned that they are just like the guards at Buckingham Palace – they won’t answer and just stare straight ahead. So I kept asking around and finally ended up calling the tourist information number, 1330. The Korean translator had never heard of the place, and then she found it and told me not very specific directions to where it was, and then I asked her to get more specific and it turns out they have been closed for the last year and there is no information on whether they’ll re-open. So by this time I decided I should get something to eat before tackling the museum. 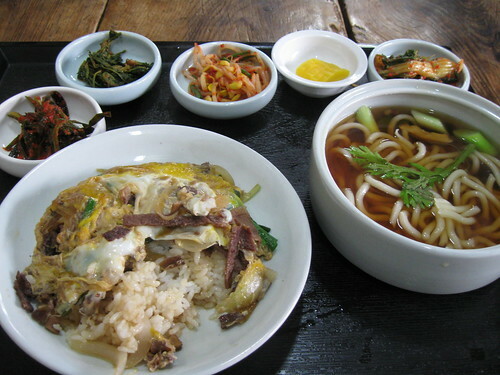 Only the area surrounding the museum (which is inside the Gyeongbokgung Palace walls) is surrounded with expensive restaurants and art galleries. I got the brilliant idea to buy some ramyeon (ramein – sounds like lamyong) noodles at a convenience store, only they wouldn’t give me any hot water so I could eat it! I loved these huge old-growth slabs of wood that were hand joined and worn from years of use. So I started to walk around the alleys and stumbled across the place pictured above. 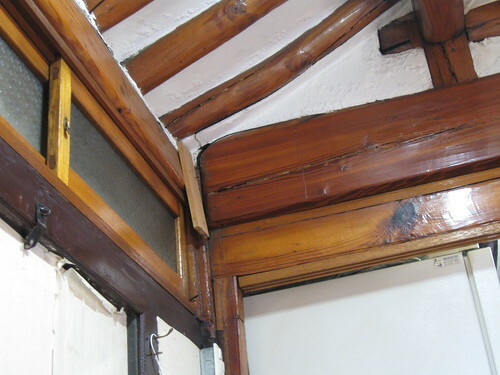 The reason this is such a hidden treasure is because it is in a traditional hanok, the traditional Korean house form. 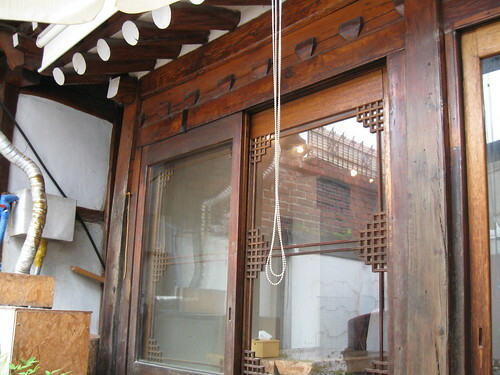 Given that Jongno is a historic district and there are a lot of hanok, you wouldn’t think it was that special. But with every other art gallery being Manhattan sleek or housed within a replica hanok, finding one that hasn’t gone yuppie is amazing. I wanted to take a picture of the gate and entry sequence, since the doors don’t go to the ground so you have to step over the wall, and the courtyard is packed earth and there are centuries old stepping stones. But an LP gas delivery guy was in my way, so I gave up. 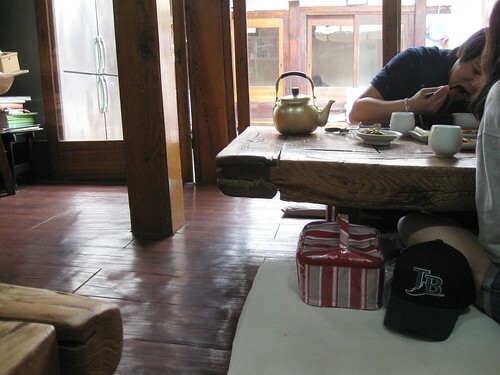 I loved this place also because it was unpretentious, well lived in, and not precious. 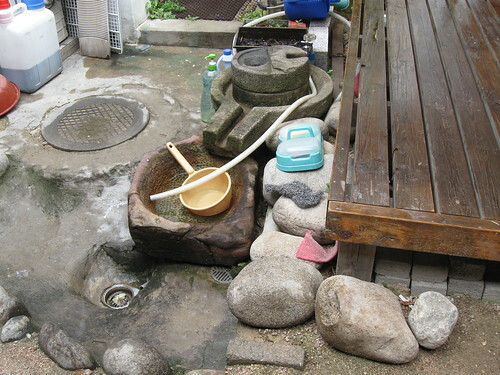 Here’s part of the courtyard – that looks like some sort of mill there, and I loved how the water trough and working drains were cut in situ right into the rock. So here was my brunch: The main dish, (I took a few bites before taking the photo) was basically rice, covered with a mixture of sauteed carmelized onions, super thin slices of beef marinated in soy sauce, garlic, and sugar, green onions, and shitake mushrooms, and then steamed with an egg cracked over the top so it forms a sort of omelette on top of your rice. The soup was soba in a really great shitake mushroom broth with shitake mushrooms and green onions. The sides were kind of typical – kimchi, daikon radish, beansprouts in chili sauce, and two kinds of greens. Cost for eating here? $6.00! Then, at the base are blind panels to fill in the wall structure. 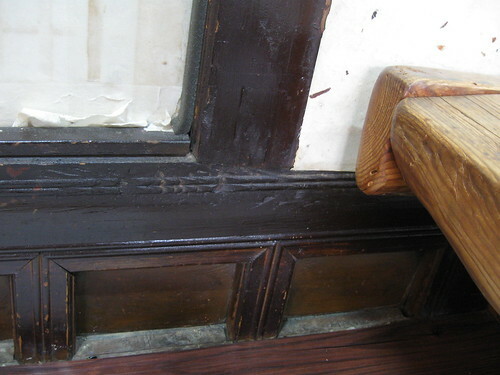 As you can see from part of the panel being hidden, modern flooring build-up was added. But what I really loved was the layers of rice paper (peeling in some places) which reminded me of a flakey croissant. I loved how they had texture, were made of natural materials, did not have an oily or chemical sheen to them, and how bright they were. I want white croissant walls and would gladly trade in the beige vinyl textured wallpaper of my officetel. I don’t care that everyone else things my place is deluxe: I miss living in a place with character. From the “music” house with its hand-painted kitchen floor, to my blue bedroom which glowed like an aquarium by the street light, and even the art deco era apartment on first hill, to the boat house with its blackened parquet floor and heavy timbered ceiling and foot thick walls, to the warehouse loft and the steel frame windows that glowed at night like a lantern and the breathtaking view of the city from the roof, and the freight elevator in our living room, to the cabin in the woods with the moss and trees growing on the roof and the franklin stove in the corner. I simply MUST find a place to live with character. I think in the next two years I must try and save some key money so I can find my own place to live. 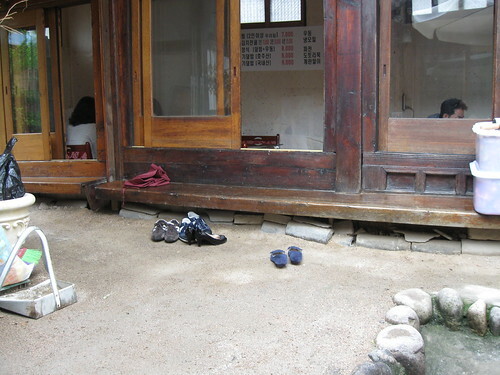 Maybe I can find a broke down old hanok somewhere. I don’t care if it has roaches and bad plumbing. Maybe when I relocate to the country that will be easier to find.